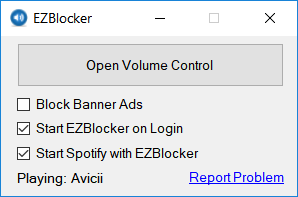 Whenever I choose a new song to play, EZBlocker mutes it. How can I fix this? Banner ads are getting blocked and audio ads are getting muted, so that’s good. But it’s also muting the first track of any new album I select. Easy to workaround, just skip to the second track then back to the first, but annoying. Any chance of total audio ad blocking coming back? Muting is obviously better than nothing but the interruptions are still non-ideal. I can’t tell you how much greatful I’am for this amazing program but the real reason why I come here to comment is to announce that since I updated to the last version of it, when it opens Spotify it starts muted (Windows 10 x64). Seems to no longer allow playing or adding songs outside of my own playlists, reinstalling spotify and scrubbing registry aswell as redownloading the ezblocker didn’t fix it. Ads are still blocked though. Hi Eric, great work btw. Unfortunately the latest version 1.7.3 and Spotify 1.0.98.78 (and the previous one) seems to stop working at certain ads. EZblocker says it’s paused and Spotify sits there looking like the next song is ready to go but it’s not playing. You can hit play or pause and spotify seems to do nothing. EZBlocker thinks it’s paused no matter whether you hit the play or pause button.